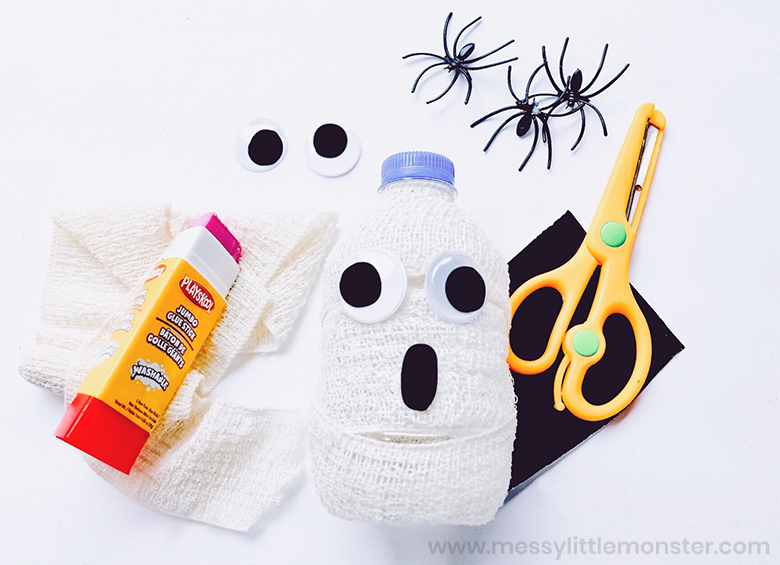 If you're looking for easy Halloween crafts for kids you are going to LOVE these mummy Halloween drinks! 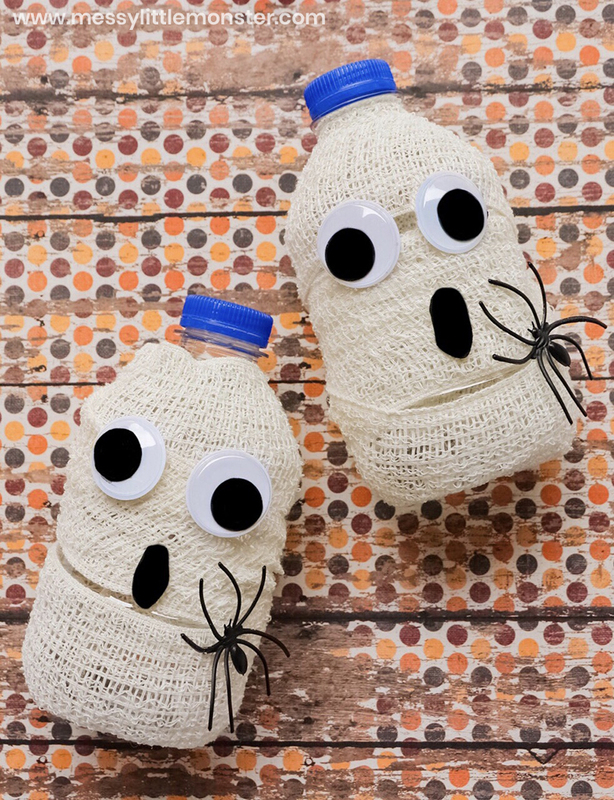 These spooky water bottles even double up as cute Halloween decorations and they would be perfect for Halloween parties or playdates. The kids will love helping you make these! 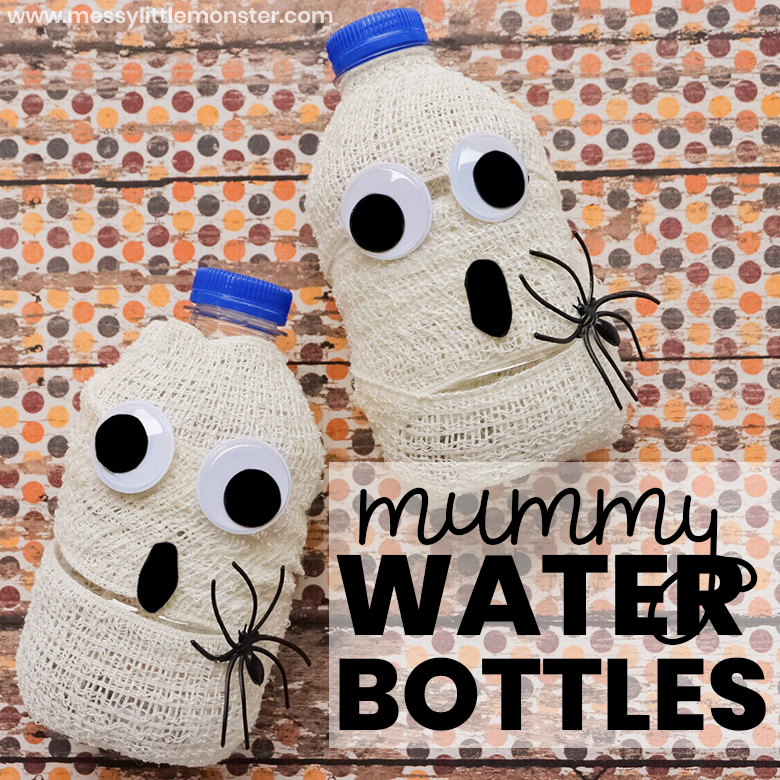 Just follow the easy step by step directions below to make your own Halloween mummy water bottles. These Halloween drinks can be made quickly with just a few supplies and the kids can easily get involved in making this easy halloween craft for kids. 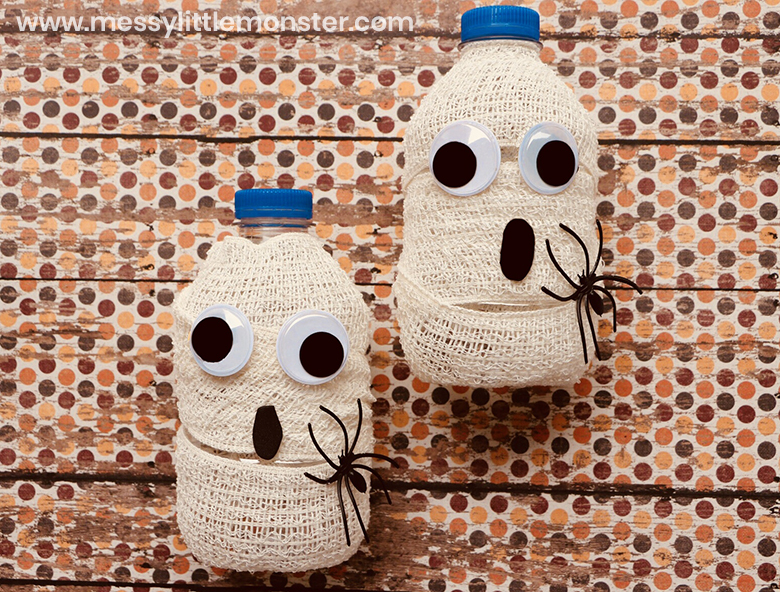 These halloween mummy water bottles would look great on a snack table for a halloween playdate or halloween party and they make such cute halloween decorations! 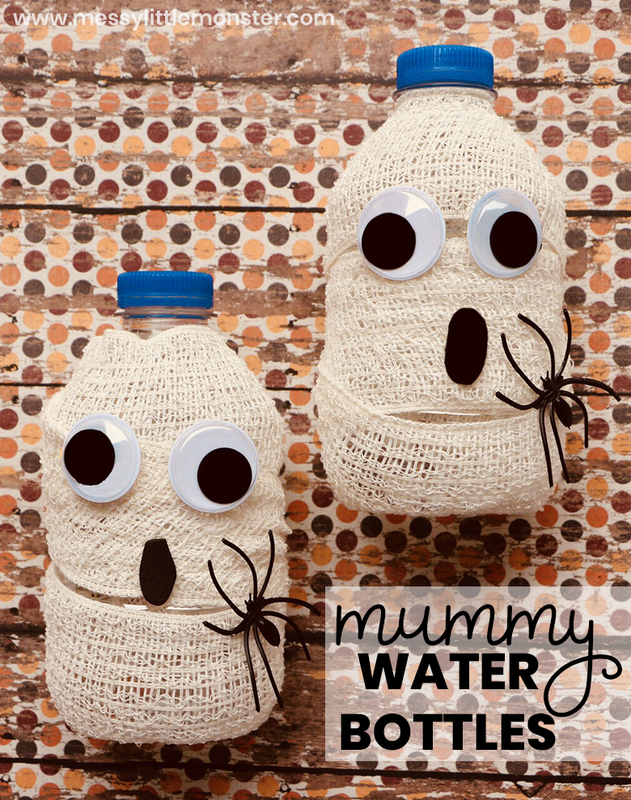 Mummy Water Bottles - Halloween drinks & Cute Halloween Decorations! Before you get started with your Halloween drink - gather your supplies. TRUST ME - this will save you so much time and headache when you aren't looking for your supplies. Start off by wrapping your water bottle with the gauze. Cut off any extra and tuck the ends under the wrapped gauze. It would be really fun to involve kids in this step, even toddlers and preschoolers will love wrapping up their water bottles! Now that you have your mummy halloween drink wrapped, time to make the face! Start with gluing on the googly eyes on top of the gauze. Then, cut out a mouth from the black paper and glue it on. 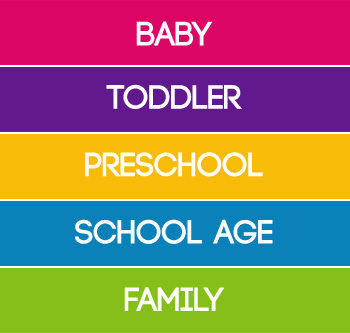 Be creative, how many diffeent expressions can you and the kids create! Lastly, finish up the details. 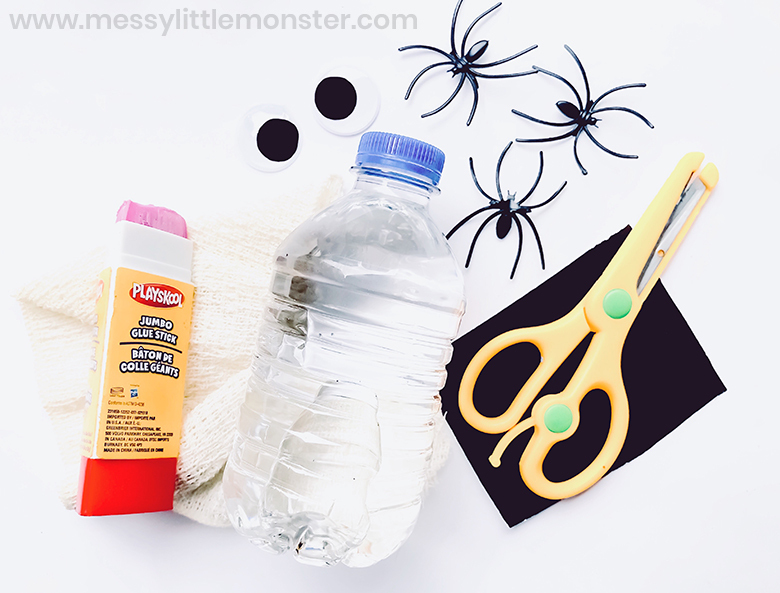 Glue on your plastic spiders to make this Halloween mummy water bottle extra spooky! Repeat for as many Halloween drinks as you need! 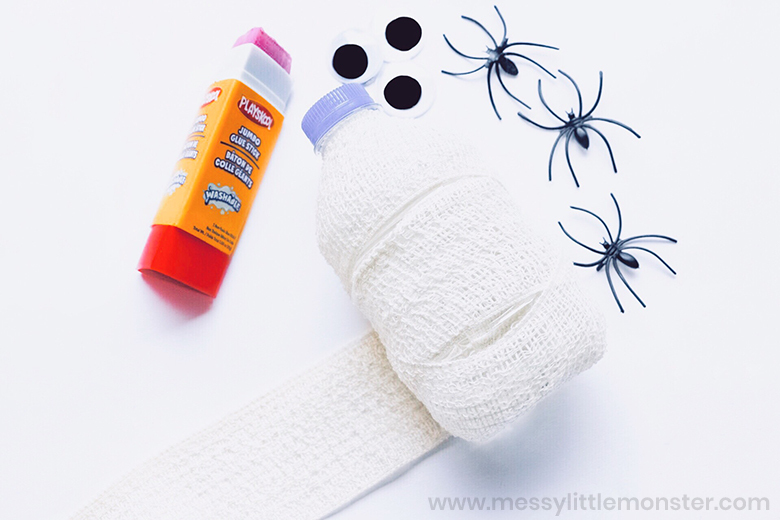 These mummy water bottle Halloween drinks are so fun to make with the kids and easy enough for toddlers and preschoolers to help. If you're looking for easy Halloween crafts for kids these are great as they double as cute Halloween decorations for your parties or playdates. Be sure to also check out our other Halloween activities for kids.